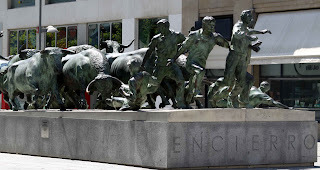 Pamplona, of course, is famous for the annual running of the bulls (in July), as depicted in this statue, right around the corner from my hotel. Located in the autonomous region of Navarra, right next to the Basque region, Pamplona has two official languages -- Spanish and Basque. 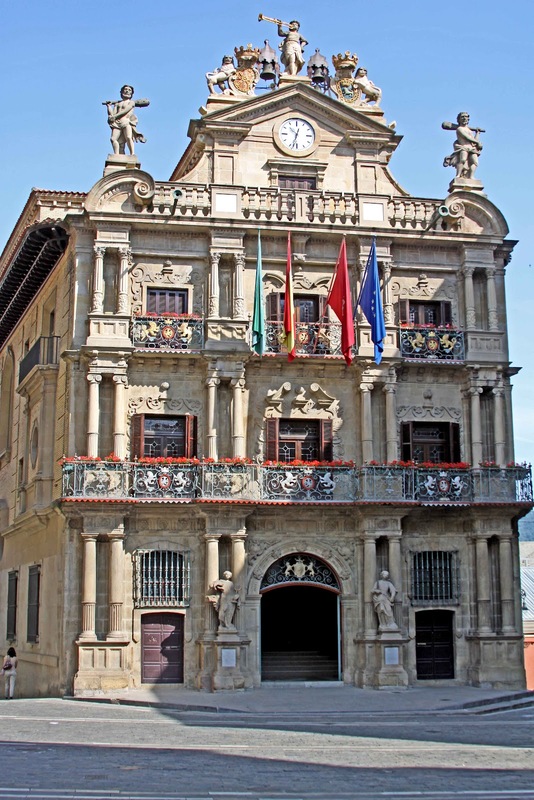 (In some parts of Navarra, only Basque is spoken; in other parts, only Spanish. 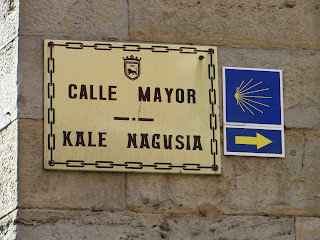 Around Pamplona, in the center, both languages are official. Just when I thought that I was doing ok with essential communication in Spanish, I come across a language loaded with Xs, Zs, and Ks. 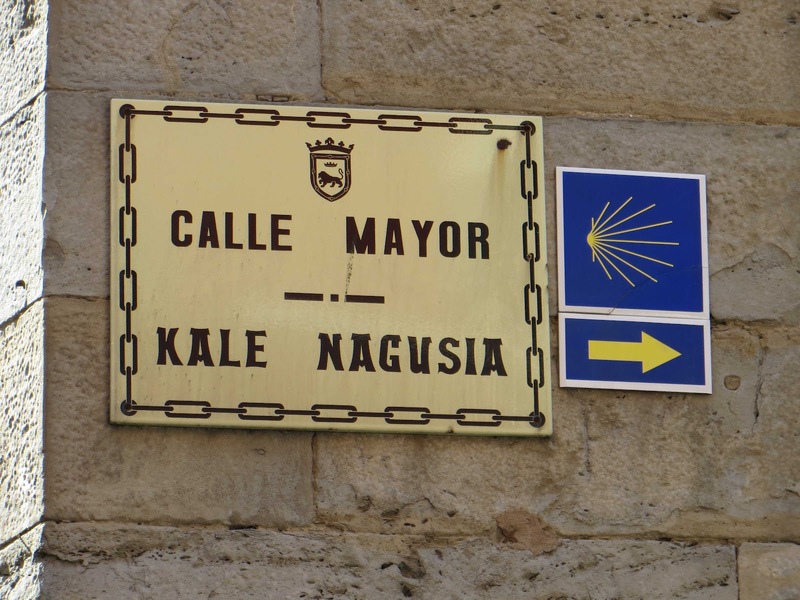 As you can see from this street sign, the languages are not similar. The more interesting feature of this picture is the way marker for the hikers making the pilgrimage along the Camino. I saw hundreds of them today, easily recognized by the scallop shell fastened to their backpacks or other articles they were carrying. I was amazed at how little they seemed to be carrying. It made me wonder whether they were simply sightseeing for the day and had stashed their heavier items in their hostels or whether they could actually travel for several weeks with not a lot more than the clothes on their backs. 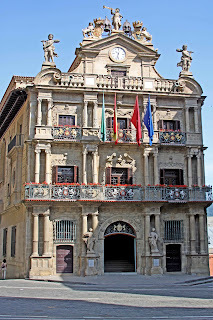 I spend the day walking the central part of Pamplona. All morning long, I noticed a helicopter circling the city and wondered why. Then, around noon, I noticed a very heavy police presence around some of the government buildings. Shortly afterwards, it all became clear to me. 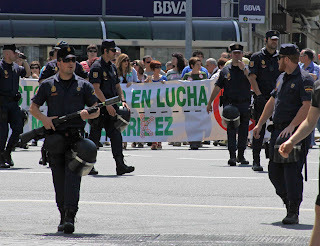 There was a massive (and very peaceful) demonstration against the current austerity measures being threatened against public workers including teachers in particular. I would guess that there were several thousand marchers in the parade, many of them with their children, including infants in strollers. 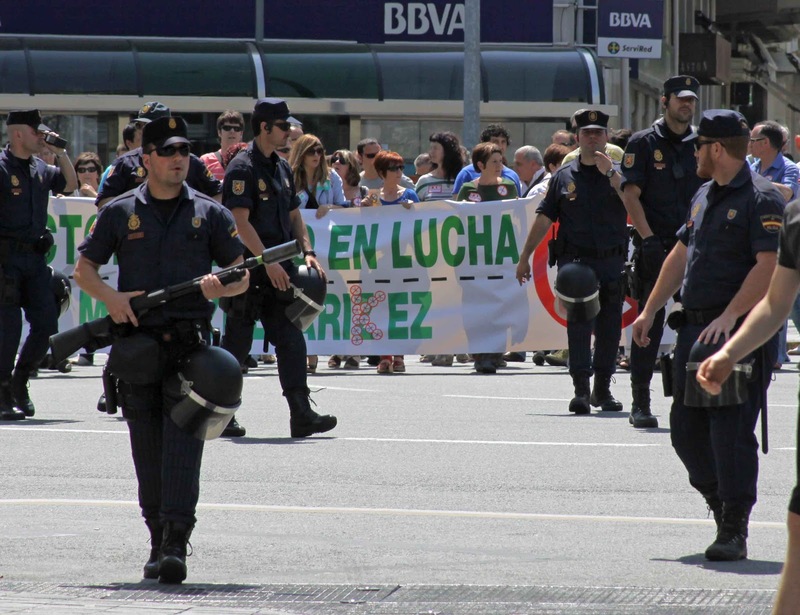 The need for the police seemed to be limited to traffic control, although several of them were armed with riot control gear. They gave no expectation of having to need it, and apparently they did not. An interesting feature of Pamplona is that there are public WiFi zones in many areas of the city, principally the parks and pedestrian malls. As I ate lunch at an outdoor cafe, I was able to browse through the news on my iPhone, thanks to this WiFi. I think that I have about walked my way through the entire city (some streets several times over), so tomorrow I will take it fairly easy until I meet up with the rest of the group in the early afternoon when we will shuttle over to Roncesvalles, where we will begin our cycling trip. I'm ready!